A new memorial area dubbed “Forever Remembered” features artifacts recovered from the wreckage of the Challenger and Columbia orbiters. Columbia’s cockpit window frames along with a section of Challenger’s fuselage stand alone in individual displays against a black background. It’s an eerie sight to see these pieces displayed. They provide a stark reminder to all that spaceflight is very, very difficult and should never be treated as routine. 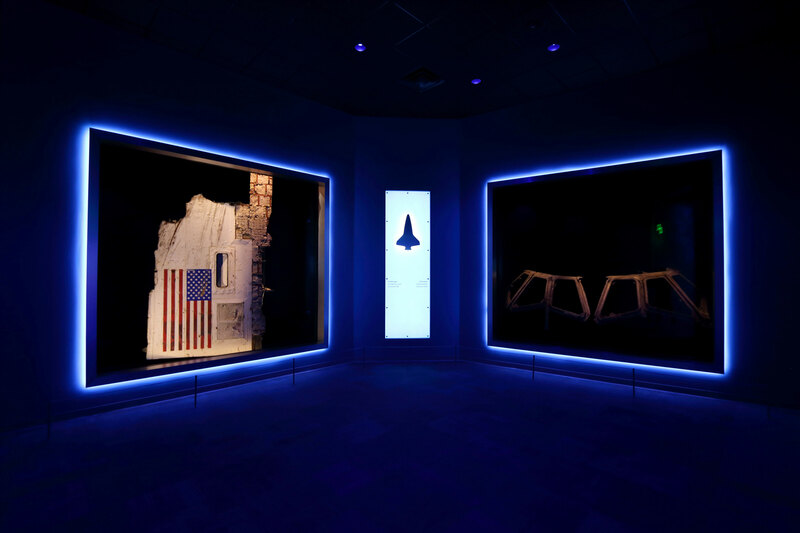 Encompassing nearly 2,000 square feet of area in the Atlantis building, the new space also contains an area honoring the 14 crew members who gave their lives in pursuit of their dreams. Included in each crew member’s display is information about that crew member along with personal items from each of them. A few items among the personal items on display are Rick Husband’s cowboy boots, a research paper written by Judy Resnick, and a vintage Star Trek lunchbox that was owned by Michael Anderson. The families of the fallen astronauts loaned items to the KSC Visitors Complex for the display along with those provided by NASA. The area also showcases the work that went into returning to flight after each of the accidents, including changes to the Shuttles, revised and new procedures for launch, new inspections both pre- and post-launch, and new processes for repairing the Shuttle on orbit in the event of foam strike damage during launch. The new display is a fitting tribute to those brave souls who made the ultimate sacrifice while advancing our continued exploration of space. It provides not only a moving memorial of the lost Space Shuttles, but memorializes their crews for all time, while reminding us of the risk every astronaut and their families take every time they slip the surly bonds of Earth. This article appeared in the September 2016 issue of RocketSTEM. Lloyd’s first interest in space began when he was a very young boy in the 1960s with the Gemini and Apollo programs, his interest continued in the early 1970s with our continued exploration of our Moon, and was renewed by the Shuttle program. Media coverage in those early days of Gemini and Apollo was huge compared to what today’s mainstream media provides. Television, magazines, and newspapers covered everything that was going on with our space program and it inspired many young people to pursue careers in science and engineering. Lloyd hopes to continue inspiring young people through his work on RocketSTEM. Lloyd enjoys all aspects of space exploration, both human, and robotic, but his primary passions lie with human exploration and the vehicles, rockets, and other technologies that put mankind into space.